Dave Stevens’ The Rocketeer and Will Eisner’s The Spirit come together in a new comic book miniseries entitled, The Rocketeer/The Spirit: Pulp Friction. Written by Mark Waid and drawn by Paul Smith, Pulp Friction unites the two characters to solve the murder of a Central City politician whose corpse is found in Los Angeles. 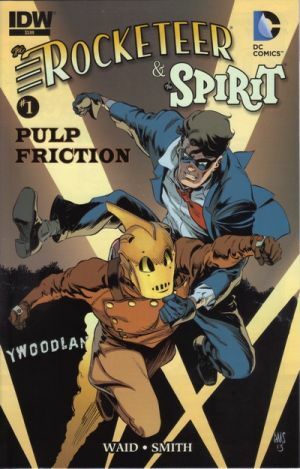 The Rocketeer/The Spirit: Pulp Friction #1 opens in Central City in February 1941. It is cold and snowy outside, but inside City Hall, it is quite heated. The story moves to the following morning, three thousand miles west. Betty, Cliff Secord’s lady, is doing a modeling shoot on a beach when she makes a grisly discovery. When they learn that a denizen of Central City has been found dead L.A., The Spirit, Commissioner Dolan, and Ellen (the Commissioner’s daughter) head to Cali. And The Rocketeer is ready to greet them.